It's been a very long time since I listened to a podcast. I used to listen to 3 or 4 of them, gradually ending up with just one. I think I finally drifted away after David Reidy discontinued his in, I think, 2012.. Now, just today, I've discovered a video podcast on You Tube that I'm enjoying quite a lot. I found Fruity Knitting, episode 16, with hosts Andrew and Andrea Doig. I discovered it because of the Google key word "fairisle" and "podcast", but there is much more than fairisle in this and other episodes. I'm only halfway through it and I'm already planning to check out the others. 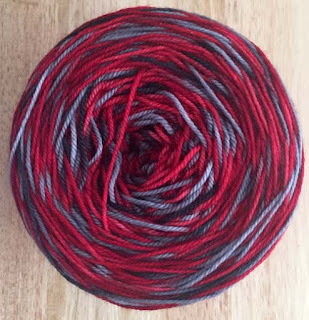 I like the tone of the podcast, the quality of the filming, and the content: I've just seen what's on their needles in a segment called Under Construction and a visit with knitter/designer Jenn Steingass of Lovewool-Knits, on Ravelry, in their Knitters Of The World segment. 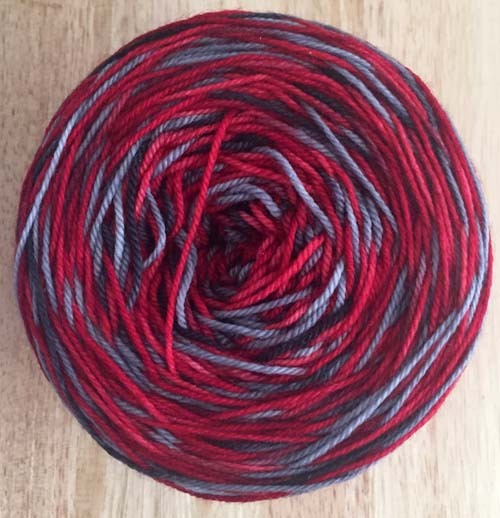 Afterwards, I'm going to check out the pattern that Andrea is knitting: League by Veronik Avery. I love the black sweater that she is wearing on the show and I wonder if there is a pattern available for it. It's a large skein of yarn, more than enough to knit a pair of socks and then to share with my friend, S. I haven't chosen a pattern yet. 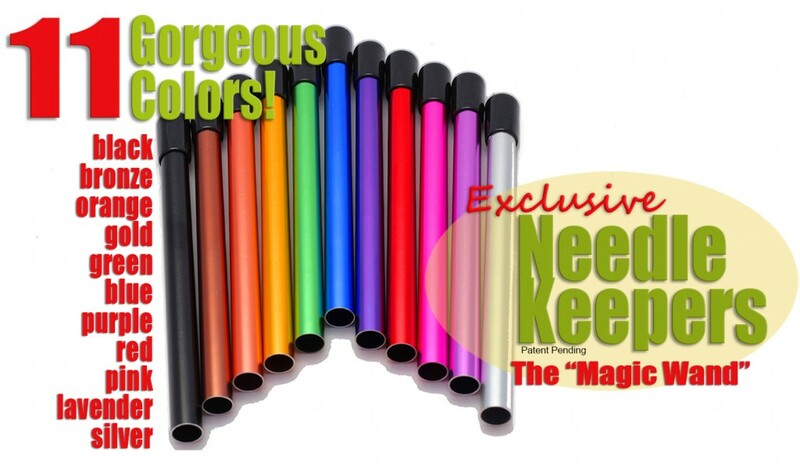 I want something that will really show off the colors to best advantage. I'm wondering if just a simple stocking stitch leg will work without any serious pooling of colors. Going to Colorful Yarns in Centennial, CO is always fun. I drop in whenever I'm in Colorado and I almost always leave a few dollars behind in the store. Tiffany (the owner) has many unique, one-of-a-kind yarns that you likely won't see elsewhere and she is always on top of the latest trends and up-to-date on the classics as well. She is wonderful at supporting indy dyers. The last time I was there I came across a new-to-me gadget used to keep your stitches on your circular needle when you're not working on your project. It's called a Needle Keeper. It's a light-weight metal tube, open at one end. At the other end has a rubber (or plastic?) stopper with a slot in which to insert both ends of your circular needles. They won't come back out unless you pull them out. I bought a red one. Sometimes (actually, often) I have more than one project on the needles so I've now added a blue one to my collection of gadgets. I've learned that these are quite widely available. Now I know and I'm happy to have found them. I wonder what I'll find next when I'm in Colorful Yarns in June? Jamieson's of Shetland (no connection to Jamieson & Smith, by the way), has a short video on their website about how raw fleece is manufactured into yarn and cloth. I like both companies so much and glad to have had a chance to tour both. At Jamieson's I bought a lovely sweater, gloves and, of course, yarn. Here's the link to the video: Jamieson's. Given the opportunity, I would be glad to visit both companies again and I would especially like to join in on the knitting get-together at Jamieson & Smith, sitting around the table in the store and knit with the others. 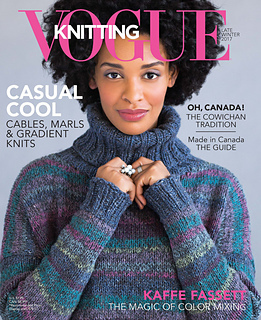 My friend, A, gave me a heads-up about the late winter issue of Vogue Knitting. I've checked, but it wasn't in the Chapters Bookstore yet. They had the winter issue, but not the late winter magazine. I'm told that the issue has quite a bit of Canadian content. I also like the sweater on the cover. It's nice to see a new Kaffe Fassett design. Okay, time to go back to watch the remainder of the podcast and knit my sock.